Zelda Online is my new project including multiplayer features like Four Swords. Goal of this project is to create a multiplayer game in which each of you can interact together, solve puzzles etc. The maps in which you play will be created by the community or yourself(see section "Level Editor"). Not all pictures are up to date and yes, the skull is a bug! Let's Play by SpritingBrad(Spanisch Commentary). Click here to see the full playlist. The level editor won't be included at first but it is planned and partly implemented. Of course there will be more objects, but currently there are no more. After the map is done you can convert your map with the help of a tool in a .lvl file. This file is readed by Game Maker and you can play with your friends in your own map. A more detailed explanation how this will work will come when I introduce level editor. The game can be downloaded from the official website. Each time you start the game the game will check if it is up to date and inform you if you need to update the game. The game saves automatically after entering a new room. If you have nobody to play look at the official website, there you find all games which are currently hosted. Since there are not much level editor maps yet you will play in Aurelia. Not all multiplayer features are included, but it is enough for the first release. - Help! Nobody can join my game. Make sure that the host set up a new firewall rule for this game. Furthermore, the host must forward his port. An alternative way is the use of tools like Hamachi. There is a detailed thread about how to make sure that other people can join your game. Click here to see it. - Are there official servers? Currently, no. Every now and then I am hosting a server but I don't want to run the game the whole time. Especially because this game is still in alpha status and a lot of errors occur so that the server would crash. - Can I play this game offline? Yes, you don't need internet to play in Singleplayer mode. And of course, nobody will join your game. - I have a fast computer but the game still runs slow. What to do? Sometimes there is a leak of memory or another problem due to other applications. Restart Windows. - Will there be a MAC or Linux version of the game? No, this game was supposed to be Windows-only. But if you use Wine you could play it on Linux. - Are Ip-Addresses saved if I play the game? Your IP-adress is saved and showed temporarily on the main page of the website so that other users can see that you are playing and join your game. If you quit the game your IP-adress is deleted from the database and not showed anymore. WOW DUDE! nice to see you are back with a new project! And sounds awesome too! So we will play in Aurelia?! The entire overworld or just a small section? Anyways, It´s great to see you guys back with a new project, I´m hyped! Currently it is only me who is doing this project. Every now and then I have improved the engine of Echoes of Aurelia and someday I wanted to implement multiplayer features. Exactly it is some kind of Four Sword Mario Maker game. As long the level editor is not implemented all maps from Echoes of Aurelia will be playable. You will be able to create a teleporter which teleports you to the various maps of the unfinished game. The tileset on #screen 1 & 2 are from Pokémon. The map was created in Tiled and loaded by Game Maker. Theoretically you can use each tileset you want, this Pokémon tileset was similar to the MC tileset so I chose it. And no, it won't be possible to change art-styles. Only you?! Wow, that´s impressive! 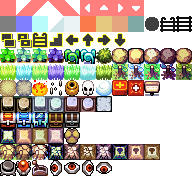 Any tileset? Wow, thats very cool! But if you use, lets say, OOA tiles, would the MC link stand out? Or can you change the sprites for characters too? But it is way too much work to change the sprites for characters since MC has items which are not present in OoA and backwards. A lot of sprites would be needed and I won't do those. Furthermore, the animation time is different in each zelda title. Three new screens showing the tile screen, the chat box and an incomplete miniboss. Wow, what an ambitions project! This looks like it's meant to be some sort of MC version of the popular Zelda Classic engine, complete with level designer and FS-style multiplayer. The game can be downloaded now from the official website. Have fun! A lot of time has been spend to do this. More updates are comming, feedback is always welcomed! Don't forget to forward a port if you are hosting a game, so that other players can join your game as well. I will also try to visit some of you if you are hosting a game. I have like three videos done of 20 mins each and I barely scratched the surface it is really a lot of fun, Thanks dude! Thank you very much! I have seen your Spanish IP on the website and assumed you was playing this game. I also tried to join your server but it seems that you need to forward the port first. If you want to record some multiplayer gameplay: If you see me hosting "Host: Rayo" join my game(I am currently hosting a game in the background). Also, is there an in-game chat? If it is a Multiplayer game, there HAS to be one. If you press "C" a command box will appear. This is the chat box(And also the place where you can input cheats). Replace the old .exe with the new one and it will work. Also, while playing, link bugged out a couple of times, like when he entered one of the caves and then attempted to come out, he will walk out, then in automatically and then then game would crash. Also in some unfinished maps, link walked on water and in mid air, I think he turned into a god there xD I was laughing all the way. Ok, I have just noticed: Once you leave the ice cave the game can not be played anymore. I will fix that right now. I updated the game too. Available cheats are written in cheats.txt. After you have entered a correct cheat in the command box a sound should play as confirmation.